Outside the chalkboard reads ‘Voted Sydney’s best café’. But according to whom? We ask the waiter and he says ‘The Lifestyle Channel’. We search the internet but can’t find any trace of the award. We call the café 3 times but no one calls us back. So we decide try the café ourselves. A mix match of chairs, tables and cushions line the front of the café and it looks really cute. The waiters are nice but not friendly and the chairs are trendy but not comfortable. The menu however is impressive. The prominence of vanilla bean draws our attention and it’s hard to decide what to have. 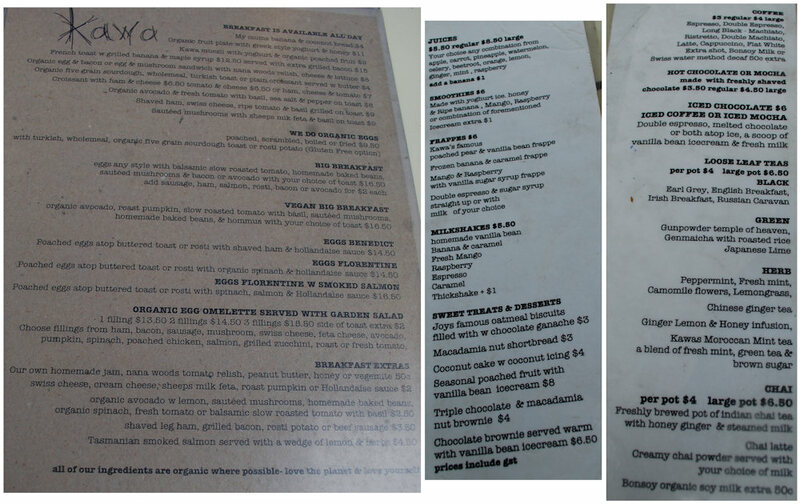 For the benefit of readers we’ve reproduced the menu here (minus the specials). Truly drool worthy. Smoothies are available with a variety of fruits so Dane tried all of them together. We’re glad they agreed! The yoghurt ice, honey & ripe banana, mango and raspberry smoothie ($6) with ice cream ($1) was an excellent choice despite the allure of other drinks such as the poached pear and vanilla bean frappe. 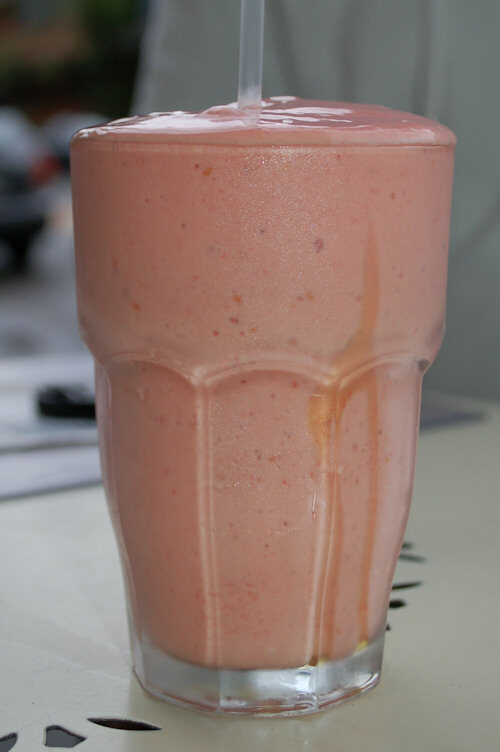 The smoothie was thick and delicious, missing the flavour of any mango but the banana and raspberry blended with the other ingredients made up for it. The skim cappuccino ($4) was delicious and creamy. Everything we expected. Dane ordered the French toast with grilled banana and maple syrup ($12.50) and added bacon ($2.50). 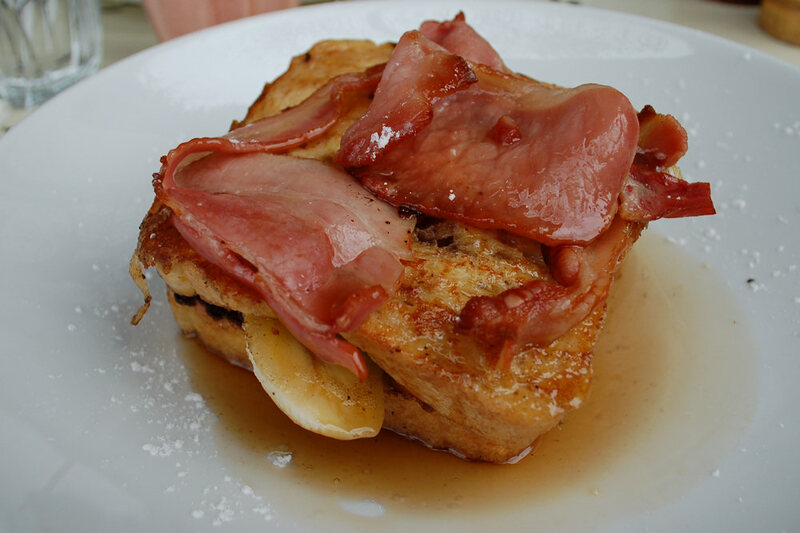 The dish is presented in layers: toast, banana, toast and bacon with delicious gooey maple syrup covering the lot. The French toast reminded Dane of his mother’s recipe. It had been prepared very well, moist inside with just the right amount of frying. The amount of bacon was generous for $2.50 and their was a whole banana squeezed in there somehow. The dish was surprisingly filling – the sweetness of the syrup quells any thoughts of ordering a second serving! 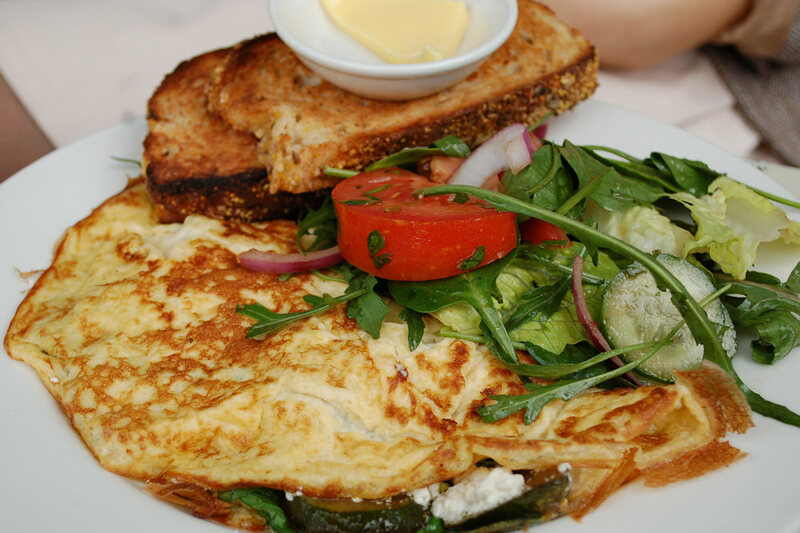 The organic egg omelette ($15.50) can be ordered with a choice of fillings. We ordered feta, zucchini, spinach and a side order of toast. The combination was delicious and the light salad was a great accompaniment. The toast however came cold and dry, we would’ve preferred fresh bread or warm toast to go with the omelette. We were pleased with our visit to Kawa Café. We would not vote it as Sydney’s best café and find it slightly pretentious that they would display a board claiming the title without stating the source. However that’s not to say that we didn’t enjoy our visit. 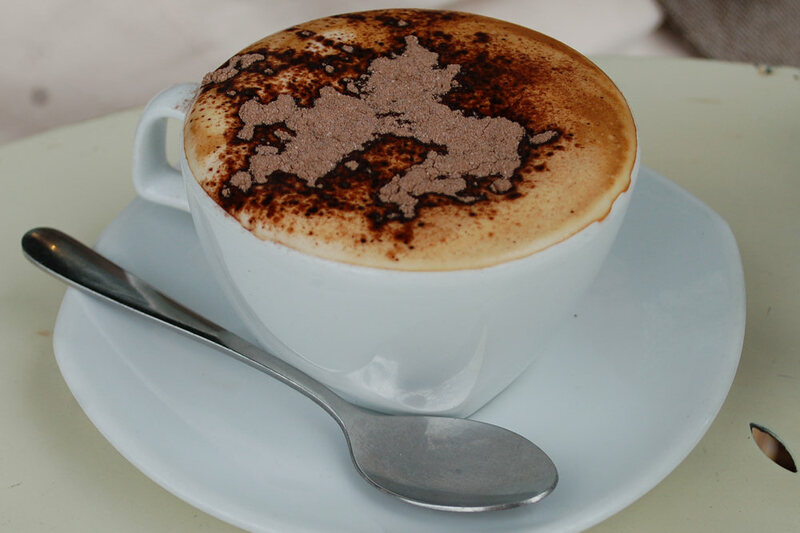 We’d like to go back to try their frappes, brownies, baked eggs special and other breakfasts, lunches and dinners! 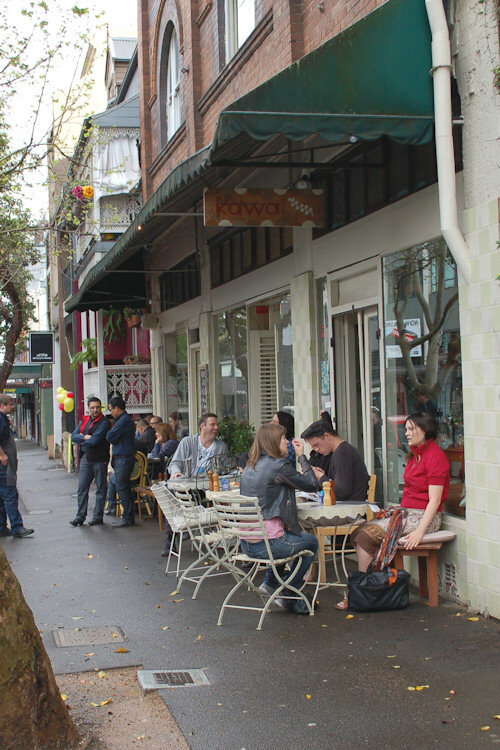 Kawa is located in a very trendy part of Sydney. We can recommend some interesting stores such as: Grandma Takes a Trip, Flight 001 and Thomas Dux. Spend the day shopping for vintage clothes, be a cafe tramp and have another coffee close by or hop to a bar on Oxford Street for a drink, the choice is yours. This entry was posted in Sydney - CBD and tagged Fresh fruit and vegetable stores close by, Organic Options, Outdoor seating. Bookmark the permalink.